We are excited to announce the availability of DXA during VP6D. Bob Schmieder KK6EK of Cordell Expeditions offered the use of DXA and we gladly accepted. By pointing your browser to http://www.dxa3.org/vp6d/ DXA allows anyone with an ordinary browser to see VP6D activity, in near real time. Within 60 seconds of your contact with VP6D, the browser page is automatically updated to show your call sign, this confirms that your contact is in the log (DXA reads the VP6D log). This process eliminates the need for duplicate contacts on the same band / mode and minimizes the confusion caused by pirates or other DX-peditions operating at the same time. During our equipment consolidation weekend in California we performed an end to end DXA test: N1MM => BGAN => Inmarsat satellite => DXA3 server => laptop. We are confident that DXA will significantly reduce, or eliminate, the hundreds of e-mails asking for “log checks”. If you see your call sign on DXA you’re in the log. Thanks to Bob KK6EK, Pete W6OP and the DXA team for their support. Speaking of logs, we will upload the log every day to the VP6D.com - Log Search tab. We do not use Clublog and there is no Leaderboard. 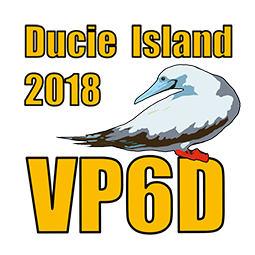 With the loan of a portable 6m EME antenna - Lance W7GJ - has prepared the VP6D team to put Ducie Island on 6 EME for the first time ever. Operation will be on 50.200 JT65. We intend to be active at Ducie moonrise on most days and occasionally during moonset. Watch our Twitter feed for up to the minute information. Follow us on Twitter / Facebook for updates from the island. We installed and tested a bridge between our Garmin inReach =>Twitter =>Facebook. The cost of this project is ~$175,000(USD). To date, we are at 87% of our donation target. Our goal is all donations plus OQRS income will cover 50% of the project cost, with the team members paying the remaining 50%. There’s still time for you to join the hundreds of DXers, and many foundations, clubs and corporate entities already on the list. There will be at least 3 DX-peditions operating in the Pacific during Oct / Nov. Please make sure you’re working and logging the correct DX-pedition – VP6D operating frequencies are listed on the website. DXA will enable you verify your VP6D contact(s).